DON’T BE FOOLED by that cute face….but how can you resist that expression? 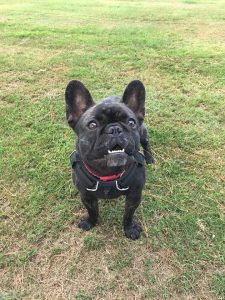 Dolly is a 10 month old French bulldog girl. She loves people, interaction and affection. She really doesn’t like other dogs or cats, and comes with her own portfolio of ‘interesting’ behaviours that her new family will have to work on! Adults only home, please, as an only pet, with patient owners who have the time to provide the input and work that little Dolly desperately needs.